The unusual combination of a dry, sunny, warmer climate with mineral-rich glacial soils, natural rootstock, and industry leaders with an unrelenting focus on quality, has thrust the Walla Walla Valley into the limelight of the wine world. Walla Walla wines are known for their refined elegance, structure, and complexity, firmly rooted in this unique terroir of the Walla Walla Valley. Geographically, the Walla Walla Valley is located in the southeast corner of the Columbia Valley appellation, straddling the Washington/Oregon state line. About the same size as the Napa Valley, Walla Walla is buttressed against the beautiful Blue Mountains on the east, Vansycle basalt ridge on the south, and rolling Palouse Hills to the north. Walla Walla means “many waters” and was the name of the local Native Americans who inhabited the valley. The Walla Walla Valley is unique in its climate and geology. Warmer and windier than other parts of the Columbia Valley, Walla Walla is also heavily influenced by the Blue Mountains. The southwest prevailing winds that blow up the Columbia River rise over the Horse Heaven Hills and blow into the valley, right in the path of one of the largest generating wind farms in the continental U.S. Rainfall is minimal, with about 8 inches in the south and western portions of the valley, increasing to as much 22 inches in the northeast foothills of the Blues. Cool night-time air out of the Blue Mountains creates larger diurnal temperature differentials between day-time high and night-time low temperatures, often as much as 50°F, ideal for ripening fruit while preserving natural acidity. vineyards planted in some shallow diverse combination of these soils directly on top of fractured basalt (Ferguson Vineyard). People have had the largest impact on the reputation and quality of the Walla Walla Valley. An unparalleled commitment to this quality by the early industry pioneers set a high standard for newer wineries and vineyards to follow. 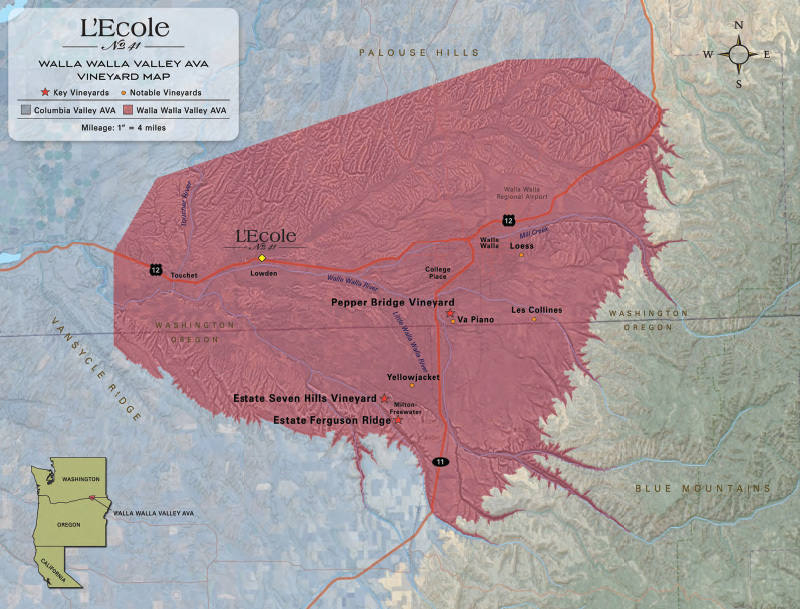 Leonetti Cellar, Woodward Canyon and L’Ecole N° 41 all started over 30 years ago. As friends — yet competitors — there developed a strong camaraderie and focus on doing everything in our power to be the best, enologically and viticulturally. State-of-the art vineyard practices include: utilization of sophisticated irrigation equipment and software; vertically trained and balanced canopies; and an intense focus on environmentally-soft, biologically-based sustainable vineyard practices. Our Estate vineyards and Pepper Bridge Vineyard are Certified Sustainable and Certified Salmon Safe and are part of VINEA, a sustainable vineyard program tailored specifically to the micro-climate of the Walla Walla Valley. We utilize organic composts and earth compost tea to build soil health and nurture healthy vines, virtually eliminating the use of herbicides and pesticides.